Biodiversity and ecosystem health is integral to the organic approach; IFOAM’s Principle of Ecology states that “Organic Agriculture should be based on living ecological systems and cycles, work with them, emulate them and help sustain them”, while the Principle of Health highlights the importance of a healthy ecosystem to support healthy crops, animals and people, and equally, the role of organic agriculture in sustaining and enhancing the health of ecosystems and organisms. This integration of biodiversity and agriculture contrasts with the food production vs. biodiversity conflict arising from intensive/conventional production methods. The biodiversity impacts of organic vs. conventional agricultural systems are now fairly well characterised, with wide acceptance of the biodiversity benefits of organic systems. The challenges now are to extend this research into the effects on ecosystem function, ecosystem services and associated valuation, and to develop further the idea of functional biodiversity as integral to organic systems. Dr Jo Smith, Dr Ambrogio Costanzo, Prof Martin Wolfe. The biodiversity impacts of establishing a silvoarable agroforestry system – Whitehall Farm, Cambs. The establishment and development of a silvoarable system on previously intensive conventionally farmed land on black fenland soils at Whitehall Fm, Cambridgeshire, is likely to have a considerable impact on the wildlife in the area, and subsequently, impact on the ecosystem services this biodiversity help deliver. We aim to monitor a range of plants and animals to see how the communities change as the system develops over the next few years. 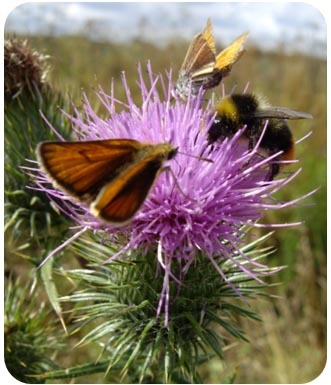 Before the trees were planted in October 2009, we carried out a baseline survey of butterflies, bumblebees, soil and litter invertebrates and vegetation in the proposed agroforestry system and two controls: the adjacent organic arable system and a neighbouring conventional farm. We aim to repeat the surveys at regular intervals. Ecosystem services in agroforestry – PhD in partnership with University of Reading. Agroforestry, a land-use system that integrates trees and shrubs with crops and/or livestock production, builds on the idea of ecological design to optimise beneficial interactions between the components which can lead to high productivity and provide a wide range of ecosystem services including soil management, microclimate modification, biodiversity support, pest and disease control, nutrient recycling and carbon sequestration. Currently unsupported by agri-environment schemes in England, scientific evidence of the multiple benefits of agroforestry is needed to inform agricultural and environmental policy makers. This research will: (i) identify which goods and services agroforestry systems can deliver, (ii) quantify the values of these services (ecologically and economically), (iii) inform the process of how policy can support these activities. Non-inversion tillage effects on biodiversity. As part of a project assessing the energy use, agronomic and ecological effects of a non-inversion tillage system, the Eco-dyn, the impacts on earthworm and arable weed biodiversity have been evaluated. Belowground Biodiversity Organic farming practices have been shown to benefit a wide range of above-ground taxa through increases in abundance and/or species richness. In relation to policy development, there is a parallel need to collate evidence on whether management practices that contribute to this effect above-ground (e.g. prohibition/reduced use of chemical pesticides and inorganic fertilizers) similarly affect below-ground biodiversity. Through a combined process of literature review and stakeholder interaction through expert groups this report addresses this issue but also considers the effects of below-ground biodiversity on the maintenance and enhancement of a range of ecosystem services. OF0165 Factors influencing biodiversity within organic and conventional systems of arable farming. Previous studies suggest widespread positive responses of biodiversity to organic farming. Many of these studies, however, have been small-scale. The purpose of this project was to test the generality of responses to arable organic farming (i.e. cereal-growing farms) in England through a multi-taxa study of a large number of farms. Abundance and diversity of higher plants, spiders, carabid beetles, wintering birds and bats were measured on matched pairs of organic and conventionally managed farms. Extent and potential quality of non-crop habitat were also measured. Two key issues addressed by the project were (a) whether biodiversity differences between organic and conventional systems arise from amount and management of non-crop habitat or from differences in crop management systems and (b) the importance of duration under organic management.